And drench me in loneliness. Art, true art, is the desire of a man to express himself, to record the reactions of his personality to the world he lives in. To provide for the next generation of men. My heart is tuned to sorrow, and the strings Vibrate most readily to minor chords, Searching and sad; my mind is stuffed with words Which voice the passion and the ache of things: Illusions beating with their baffled wings Against the walls of circumstance. Oh! To be a butterfly Still, upon a flower, Winking with its painted wings, Happy in the hour. And between us is sprung a smoky wall? Not so much as a scrawl to say you could not write! Oh! To be a flower Nodding in the sun, Bending, then upspringing As the breezes run. Roots of lilac under all the soil of New England, Lilac in me because I am New England. Fifteen millions of soldiers with popguns and horses All bent upon killing, because their "of courses" Are not quite the same. Poetry is the most concentrated form of literature; it is the most emotionalized and powerful way in which thought can be presented. 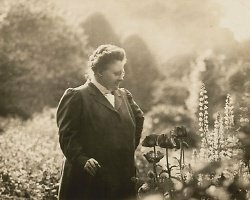 Bio: Amy Lawrence Lowell was an American poet of the imagist school from Brookline, Massachusetts, who posthumously won the Pulitzer Prize for Poetry in 1926.